A new ontology development paradigm has started; its emphasis lies on the reuse and possible subsequent reengineering of knowledge resources, on the collaborative and argumentative ontology development, and on the building of ontology networks; this new trend is the opposite of building new ontologies from scratch. To help ontology developers in this new paradigm, it is important to provide strong methodological support.However, up to date, there are no methodological approaches that help ontology developers to build large ontologies embedded in ontology networks in complex settings where distributed teams could collaboratively build ontologies by reusing and possibly reengineering knowledge resources. 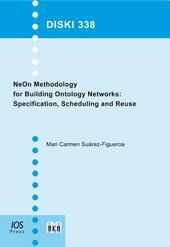 On the other hand, the approaches available are not described with a user-oriented approach, but with a style that is more oriented to ontology researchers than to developers.To alleviate this methodological need, this book presents the NeOn Methodology, a scenario-based methodology, which provides prescriptive guidance for key aspects of the ontology engineering process, that are (1) the reuse and reengineering of ontological and non-ontological resources, and (2) the development of ontology networks. This book also offers detailed methodological guidelines for specifying ontology requirements, scheduling ontology development projects, and reusing ontological resources.